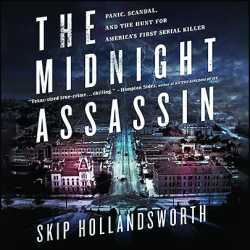 Set in Austin, Texas—the capitol of the newly minted Lone Star state— The Midnight Assassin recounts a series of eight ghastly murders that were committed during the years 1884 and 1885. More like annihilations, these butcheries incited panic and paranoia in this frontier town of 17,000 people, and undermined municipal efforts to make Austin a mecca of prosperity and modernism. Prof. Gershman mentions a PBS TV documentary that identified the killer as 19-year old Nathan Elgin, who was allegedly apprehended at a crime scene, whose involvement was supported by additional circumstantial evidence, and after whose death these killings stopped. Yet, Hollandsworth discounts this possibility in his book leaving readers with a well-written dramatic story of one of the oldest (and almost forgotten) murder mysteries in the history of America. Bennett L. Gershman, The Midnight Assassin: Panic, Scandal, and the Hunt for America’s First Serial Killer, New York Law Journal of Books (2016). The Servant Girl Murders, Austin, Texas 1885 – The Servant Girl Annihilator. Rebecca Salinas, Look Back at the Serial Killer that Terrorized Austin in the 1880s, MySA (Apr. 28, 2015). Skip Hollandsworth, Capital Murder: Who Murdered Seven Women and One Man in Austin in a Brutal Year-Long Spree that Began in Late 1884? I’m Hunted by the Details of his Crimes – and I’m not Alone, Texas Monthly (July 2000). Travis Willmann, Interview: James Galloway on The Servant Girl Murders, Ephemera News – Tex Libris (Jul. 10, 2014). PBS TV, HDSI – Texas Servant Girl Murders, History Detectives Special Investigations (Season 11). Macabre Tourist, Servant Girl Annihilator, YouTube (Jun. 5, 2015). The prosecutor in the Michael Morton case in Texas, in which the defendant was exonerated, has pled guilty to criminal contempt for intentional non-disclosure of exculpatory evidence and will give up his law license, perform 500 hours of community service, and serve 10 days in jail. Among the withheld evidence was the account of an eyewitness, the defendant’s son, who said he was not the murderer. No matter what one’s views are on this unprecedented event, it should raise consciousness about the risk of withholding substantial exculpatory evidence and risking the conviction of an innocent person.